Founded in 1990, McManis Family Vineyards is owned and managed by Ron and Jamie McManis, fourth generation winegrowers, and is located in the rich agricultural region of the northern California interior. Currently, the family grows a wide selection of grape varieties on 3600 acres of premium vineyard land. Committed to sustainable farming, McManis Family Vineyards participates in the Lodi Rules for Sustainable Winegrowing which “…promotes practices that enhance biodiversity, soil and water health, community and employee well-being.” Working towards certification for all their family owned vineyards, in 2013 McManis Family Vineyards was awarded their first Lodi Rules Certification for their Damir Vineyard, located in Stanislaus County, California Appellation. We have now added Browns Lake, River View, River Junction, Liberty (Lodi) all in San Joaquin County and Wildwood Ranch in Stanislaus county all California Appellation to our Lodi Rules Certification. McManis Family Vineyards is recognized as a leader in the region in the application of premium grape-growing practices: the use of select rootstocks and clones, specially chosen to perform well in the soils and sub-climates of California’s northern interior, in combination with labor intensive fruit management techniques, such as leaf pulling and cluster thinning. Acknowledged as trustworthy and passionate about growing superior fruit, Ron and Jamie McManis have been successful in gaining a reputation for supporting and encouraging their neighbor growers. With an eye toward the future, the family continually invests in the latest equipment and farming advances, continuing to plant 100-150 acres annually and sharing their knowledge with their grower-partners. The McManis family is credited with the 2001 successful petition for the 1300 acre River Junction AVA (American Vineyard Appellation), just west of the city of Ripon, at the confluence of the Stanislaus and San Joaquin Rivers. 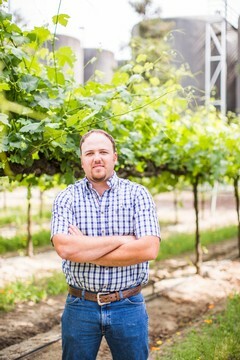 Vineyard Manager, Dirk Heuvel is in charge of day to day vineyard operations. The newest member of our vineyard team is Ed Bianchi who gratuated from Cal Poly. Together they make up our vineyard managment. 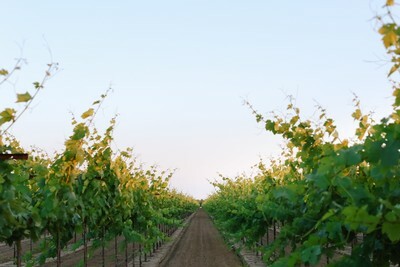 Nestled between the cool confluence of the Stanislaus and San Joaquin rivers, south of Lodi, the River Junction Appellation comprises 1300 acres, the third smallest in California. The river basin, consistently 2-5 degrees cooler than the surrounding farmlands, combined with the sandy loam soils unique to the area, is ideally suited to growing premium quality grapes. McManis Family Vineyards farms Chardonnay, Pinot Grigio, Pinot Noir, Viognier and Muscat Canelli in the AVA. Located west of the Amador County line, Borden Ranch AVA is the most topographically diverse sub-appellation in the larger Lodi AVA. With elevations ranging from 73 feet to 520 feet above sea level, the region features well-drained alluvial soils comprised of cobbles, clay pan, and clay loam, best for growing structured red wines like Cabernet Sauvignon and Merlot. Located in the east part of the larger Lodi AVA, Clements Hill is characterized by rolling hills and cliffs at the base of the Sierra Foothills. The Mokelumne River flows through the region and a variety of microclimates exist within the hills. There are granite and volcanic soils below the alluvial top soils, and the appellation is recognized for producing red grape varieties such as Zinfandel, Syrah, and Petite Sirah. Jahant is the smallest of the Lodi appellations and is most aptly defined by its unique pink Rocklin-Jahant loam soils, so much so that the boundaries of the appellation are marked by the extent of these soils. Jahant's climate is cool and dry due to its close proximity to the Mokelumne River, Sacramento Delta, and its relatively low elevations, ranging from 10 feet to 100 feet. McManis Family Vineyards produces Pinot Noir, Petite Sirah & Petite Verdot in the Jahant Appellation. The Mokelumne River is an American Viticultural Area located in San Joaquin County, California. It is located in the southwest part of the larger Lodi AVA, and includes the city of Lodi and the towns of Woodbridge and Acampo. The AVA is named after the Mokelumne River, which drains out of the Sierra Nevada Mountains, into the San Joaquin River and passes through the heart of the appellation. The wine region includes a portion of the lower Mokelumne River and the Cosumnes River, a tributary.The soil in th earea is alluvial fan deposits of sand and loam. Ample rainfall and soil moisture retention allows most grape growers to farm without the use of irrigation.